There is no doubt Capitals fans enjoy seeing the Stanley Cup Champion banner swaying in the rafters at Capital One Arena. Seeing it in person evokes memories of the title run and confirms the dream did come true. Fans are ready to see more new banners rise to the roof. Chief among them, of course, would be another Stanley Cup banner celebrating T.J. Oshie’s “back-to-back” prediction. But we’re also eager to see a more retired numbers join the four already hanging above the rink. 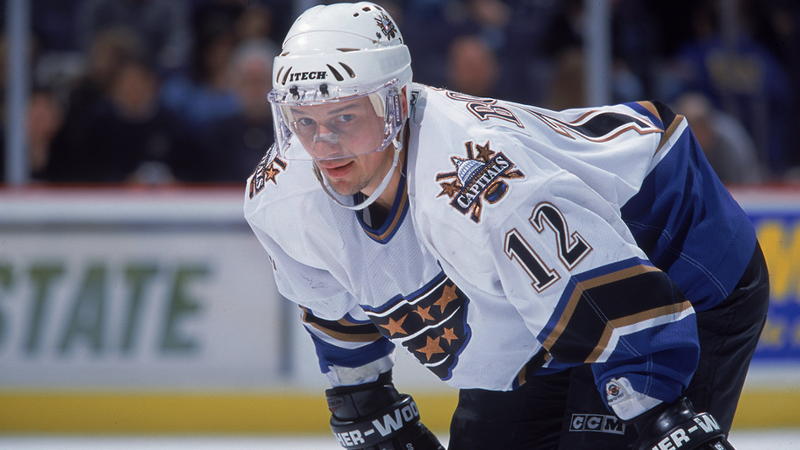 The recent twenty-fifth anniversary of his five-goal game reminds us that former winger Peter Bondra should be the next Capital legend to see his uniform number forever honored. Before Alex Ovechkin began rewriting Washington’s record books, Bondra was the greatest lamp-lighter in Capitals history. The five-time All-Star was lethal from anywhere in the offensive zone, piling up 472 goals in a Capital sweater. He twice led the National Hockey League in goals, scoring 34 goals during the lockout-shortened 1994-95 season, and potting 52 goals in the 1997-98 regular season preceding Washington’s only previous run to the Stanley Cup Final. He may have shown his most impressive goal scoring prowess during the 1995-96 season, however. After missing the beginning of the season due to a contract holdout, Bondra roared back into form, proving he was worth every negotiated penny, scoring 52 goals in just 67 games. Bondra was a special teams standout. He netted 137 power play goals for Washington, twice leading the NHL in the category. Bondra also logged big minutes on the penalty kill where his speed made him a constant threat to counterstrike. He scored 32 career short-handed goals (16th all-time), including a league-leading 6 during the 1994-95 season. Remarkable statistics aside, Peter Bondra is forever etched in fans’ memories for the way he played, for the way he made us feel. His enthusiasm was infectious. He was often a blur flying down the wing, confounding goalies with a sweet wrist shot or a heavy slapshot bomb. He was an exciting scoring threat that has us inching towards the edge of our seats every time he touched the puck. He celebrated with a goofy grin spread across his face (and that silly bandage across his nose). Sound like anyone else we know? Before Ovie, there was Bonzai. While there is no question that the Great 8 will someday be unfurled in the rafters, Peter Bondra’s number 12 should already be there. This entry was posted in News and tagged Bryan Hailey, Peter Bondra. Bookmark the permalink. If you listen to JJ Reagan hes real strict on his retired Numbers, he thinks it should be Langway and OV only. For me Im more in the oldschool mindset, you only deserve a retired number for being a HOFR&winning a Championship, or Being a HOFr and spending big chunk of your career with Caps if not all. I’m pretty strict on Hall of Fame consideration. Less so on the retired numbers. For me it is 12 and 37 now, 8 and 19 locks for the future. You must be under 35. Nope. 44 years old. Fan since the mid-80’s. I meant those four in addition to the four already retired. I was lucky enough to attend the Hunter and Gartner number retirements. I’d like it a lot more if the Caps had more of a “ring of honor” concept where you honor the player without taking the number out of circulation. I hate seeing all the numbers in the 70’s and 80’s on current Habs. i think bondra should be retired…and possibly kolzig at some point – but it’s also a bit of a joke that labre is there. i’m old enough to have seen almost every home game labre played…and we all know the only reason he is there is because abe was desperate to have something caps-related hanging from the rafters. i have a fundamental issue with how the caps have done this and think that only truly great players ON AN NHL level (not just locally popular) should be retired. the caps could have a ring of fame (like the redskins implemented many years ago) to honor players who were great capitals – but not necessarily elite nhl players. I have no qualms with Hunter/Gartner/Langway. All were both great players and great caps. And Bondra definitely falls into that category. As much as I loved watching Banzai play, I can’t see justifying any more jerseys of players from the pre-Ovechkin era being retired. Such an honor should be for those who shined in the playoffs or, in Langway’s case, saved the franchise. I’m not even crazy about Gartner’s being retired. I have too many memories of him making opposing goalies get “hot” during playoffs in the 80’s.